Don’t birthdays feel like that when you’re older? Just another day. I know for sure Asher doesn’t care it’s my birthday and he wouldn’t dare let me sleep in! 🙂 You smile and say “Yay! It’s my birthday!” (as you put another load in the washing machine, change a poopy diaper, and wipe up yogurt all over the table). Birthdays as an adult make me realize how blessed I was in my family to have been celebrated each year as a child! And don’t get me wrong, I don’t want a party for my birthday now! I am just as happy with a few thoughtful presents from family and something chocolate! But my mom made sure we felt VERY special every year on our big day. She went all out with decorations, party games, friends, cake, and presents. 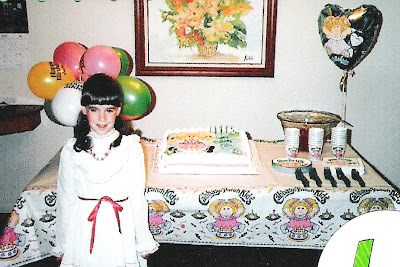 Those who know me, know that I have loved to carry on that tradition and treasure getting to celebrate each of my children with a special party in honor of them! What a joy to celebrate life! I can’t post without a picture so I thought it would be fun, since Rilyn is about to turn 6, to post my 6th birthday party picture. Obviously, I loved Cabbage Patch Kids! I feel the same way about birthdays too! Being a teacher I get countdowns from my students about their birthdays like “19 days to my birthday” – now this is something I would NEVER say anymore!